This is a Restaurant style Chicken 65 recipe. 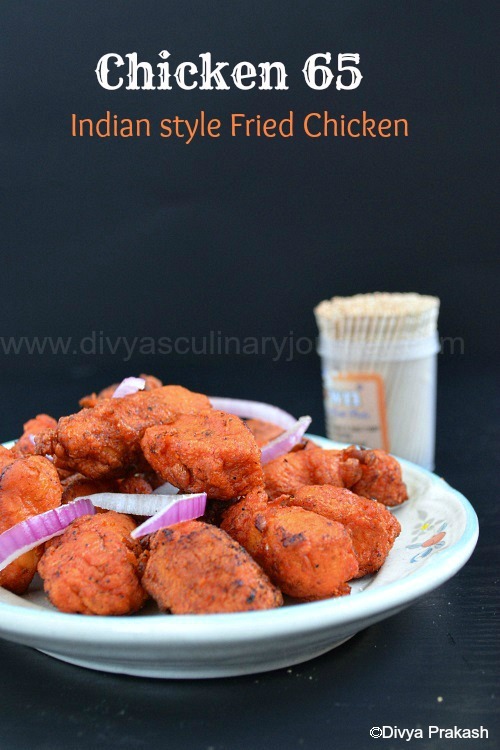 Boneless chicken pieces are marinated in spices and are deep fried and served as an appetizer or snack. Wash, clean and cut the chicken into small bite size pieces about 1" to 11/2" cube. Mix together ginger garlic paste, turmeric powder, chilli powder, coriander powder, cumin powder, pepper powder, yogurt, lemon juice and salt. 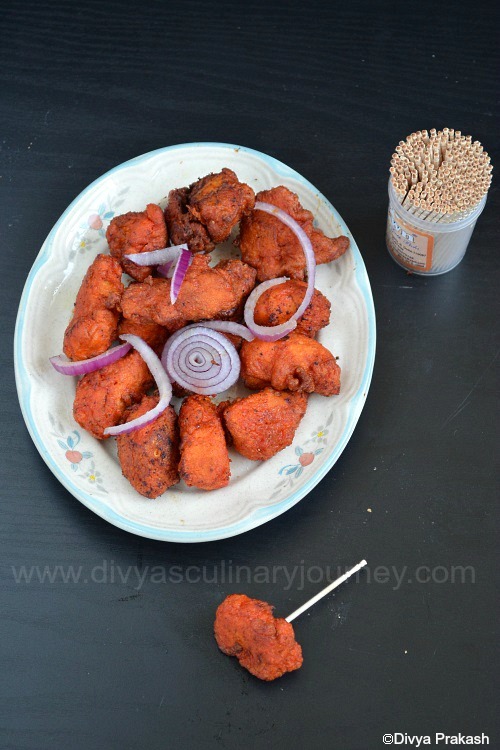 Apply this mixture to the chicken pieces till it is well coated and let it marinate for atleast 2 hours- 3 hours. Leave it in the refrigerator. Take this out and to this add corn flour, rice flour, one egg (well beaten) and food color and mix well till all the pieces are well coated. Then heat oil, and deep fry this chicken in batches. When all the chicken are fried, you can fry 1-2 sprigs of curry leaves and use them to garnish. Garnish with raw onions, lemon wedges and deep fried curry leaves and serve it. The more time you marinate the better. I usually marinate it overnight. Before deep frying, will let it sit in room temperature for 10- 15 minutes and then will deep fry it. The temperature of the oil is more important for getting the crispy fried chicken.It should be neither too hot nor less hot. 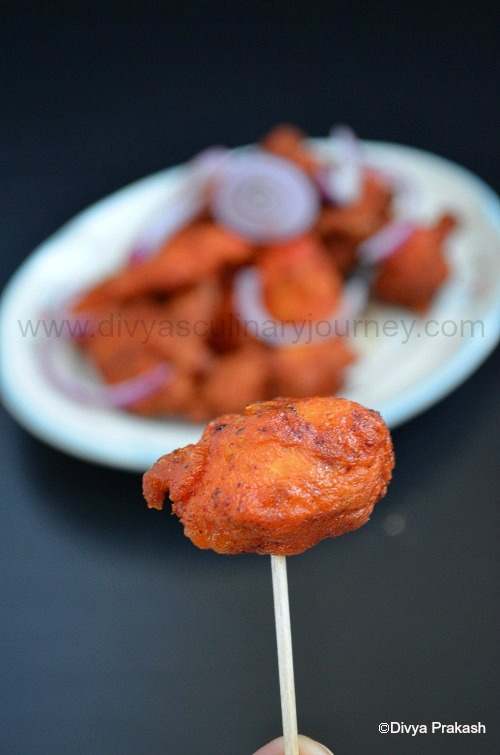 Test by adding a small piece and then Fry the chicken in batches. When one batch is taken out, temperature of oil will come down, wait till it increases and then add the next batch. very tempting dish , specially love the color. Simply great dear, mouth watering... send me some.